Producer of Komban, Gnanavel Raja gifted director Muthaiah a Toyota Innova for the film's success. 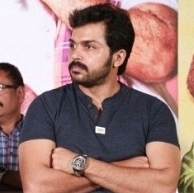 After all the trouble, the film Komban starring Karthi and Lakshmi Menon in the lead roles released on Apr 1st evening and was well received by the audience. The team gathered for a small success meet that very weekend. Further, producer Gnanavel Raja seemed very elated about the film's reception and he conveyed his appreciation by supposedly gifting director Muthaiah a Toyota Innova car. (Will the Komban team take a drive together?). Also, today (Apr 7th), the team is seen together for a grand event to celebrate its success and thank the people who supported its release. The meet started by celebrating the birthday of senior actress Kovai Sarala and then continued with the team members' speeches. We wish Kovai Sarala a very Happy Birthday and the Komban team for their success. Udhayanidhi Stalin's Gethu First Look Poster Is Out And Komban Team Celebrated Its Success. People looking for online information on Gnanavel Raja, Karthi, Komban, Lakshmi menon, Muthaiah will find this news story useful.